Many advanced economies are facing the twin challenges of an ageing population and public hostility towards immigration. This column studies the impact of demographics on attitudes towards immigration in Japan, and the effectiveness of information campaigns explaining the benefits of immigration. It finds that information campaigns are effective in improving attitudes towards immigration, especially amongst women. Deep generational gaps in attitudes towards immigration may be caused by younger men in particular viewing immigrants as potential competitors. Ageing demography and immigration are two common issues most advanced economies are facing. Whilst accepting that young immigrants may be effective in countering population ageing, public opposition to immigration seems to be generally persistent. Existing studies on the determinants of people’s attitudes towards immigration largely focus on two main strands of explanations. The first emphasises the importance of socio-cultural factors, such as the ‘national identity’ and the traditional ‘way of life’ (Citrin et al. 1997, Sides and Citrin 2007). The second strand of explanations is centred around economic considerations, i.e. viewing immigrants as potential competitors (Dancygier and Donnely 2013, Dustmann and Preston 2006). 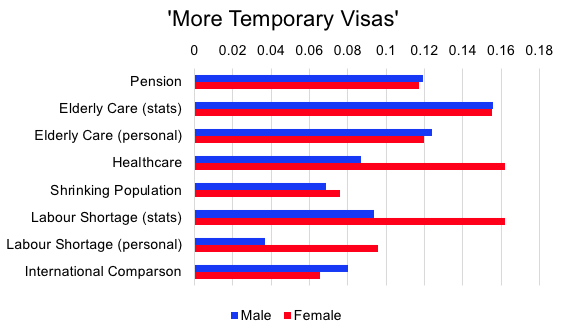 Population ageing would increase the benefits of immigration at least in the short to medium term. Thus, public opposition to immigration would ease as ageing becomes more serious if economic considerations are more important than socio-cultural factors in determining attitudes towards immigration. My study focuses on Japan. Amongst the advanced economies, Japan has one of the lowest share of immigrants, currently estimated at about 1.8% of the population (OECD 2015), and also faces the most acute population ageing. Based on an experiment run in Japan, in a recent paper (Nakata 2017) I studied the impacts of heterogeneity – such as age, gender, and educational background – on attitudes towards immigration, and the effectiveness of information campaigns that explain the economic and social benefits of immigration (complementing its companion paper, Facchini et al. 2016, which found the general effectiveness of such campaigns). 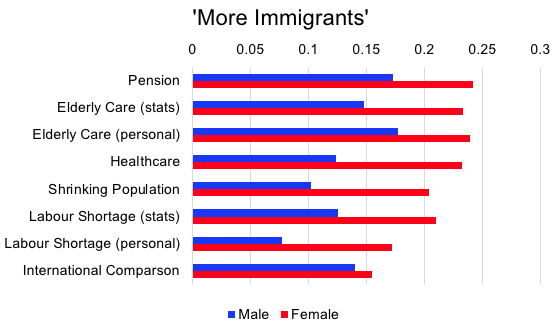 The results show that the impacts of information are significant for both male and female respondents, albeit larger for the latter, whilst there is a substantial generational gap amongst male respondents in the level of support towards immigration, as well as a difference in the impacts of educational background between genders. The experiment was administered with a nationally representative sample of 9,000 individuals in terms of age, gender, and the current address (prefecture) in Japan. To avoid social desirability bias or ‘demand effects’, the respondents were not informed of the study’s focus on immigration attitudes. Instead, participants were told that their task was to determine the suitability of texts for reading comprehension assignments in Japanese high schools. After reading a common text about the lifetime experiences of a Japanese painter, the control group was asked to read an article about recent discoveries on the planet Pluto, while the treatment groups were given a text that explains the economic and social benefits of immigration. Of the 9,000 respondents, 6,000 were asked questions on immigration policy immediately after reading texts, while the remaining 3,000 were asked the same questions 10-12 days later. In Nakata (2017), I used only the former 6,000 individuals. The information treatments were divided into eight groups. The pension treatment group received hard information about the impacts of ageing on the pension system. The elderly care (statistics) treatment group received hard information about the impacts of ageing on long-term care provision for the elderly, while the elderly care (personal) treatment group read a personal story about the impacts of ageing on long-term care provision for the elderly. The healthcare treatment group received hard information about the impacts of ageing on the healthcare system. The shrinking population group read the latest projection of future population in Japan – 30 million fewer by 2050. The labour shortages treatments were divided into two groups: one group received hard information about labour shortages, and the other read personal stories about labour shortages. Finally, the international comparison group read an article that explains the relative size of migration into Japan as compared to that of other OECD countries. I assessed the effects of treatments on the respondents’ views on immigration by asking three questions. 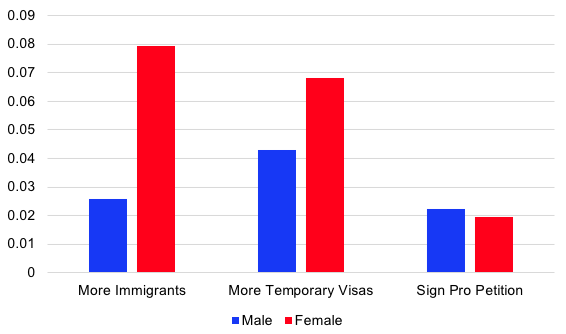 One question asked about general preferences on immigration policy (a ‘More Immigrants’ indicator), another on temporary migration (a ‘More Temporary Visas’ indicator), and the third on the willingness of the respondents to sign a petition in favour of increasing the number of immigrants (the ‘Sign Pro Petition’ indicator). For ease of presentation, I dichotomised the responses, with unity indicating a more pro-immigration stance, and zero otherwise. Figure 1 indicates that older generations tend to be more positive towards immigration. 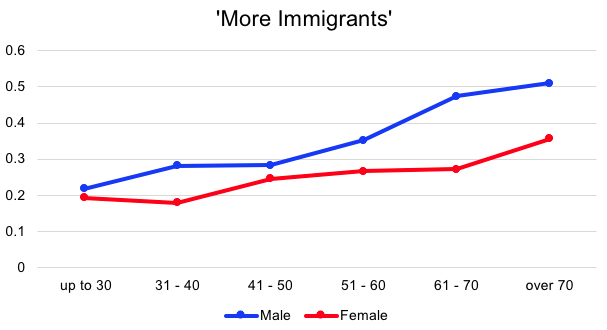 In particular, males over 60 years old were the most pro-immigration. This generational difference in attitudes is not as strong amongst female respondents. This is consistent with the line of argument that focuses on the perception of immigrants as potential competitors. As for treatment effects, they are mostly significant and are in general stronger for female respondents than for male, as Figure 2 exhibits. 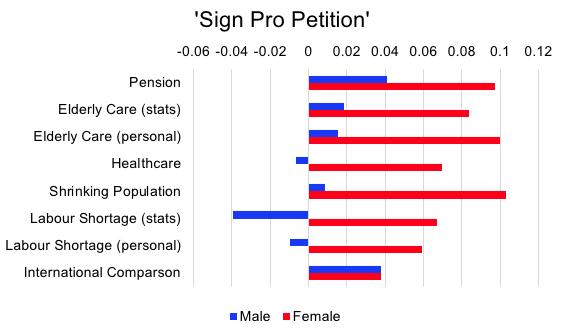 The treatment effects are indeed very strong amongst female respondents – for instance, fewer than 10% of female respondents were ready to sign on a pro-immigration petition without treatment, with some treatments increasing the proportion by 10 percentage points or more (i.e. doubling the proportion). There are no statistically significant effects of age on the strength of treatment effects (see Section 3 in Nakata 2017 for more details, where all the estimation results are reported). Note: ‘0.1’ indicates that the support increases by 10 percentage points. The effects of educational background are presented in Figure 3. 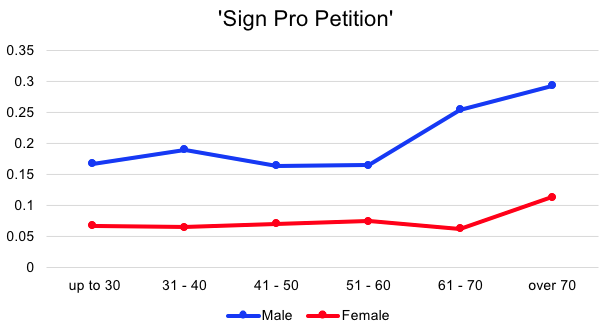 They are measured by the gap between tertiary-educated respondents and others in the proportion of positive responses, and it is clear that the effects are larger for females than for males, except for the Sign Pro Petition indicator. This may be because female respondents without a tertiary education may not be as well informed as those with a tertiary education, while such a gap is not as significant amongst male respondents. However, I do not find any statistically significant difference in either the strength or the size of the treatment effects due to educational background even amongst female respondents. Thus, the results suggest socioeconomic characteristics matter more for females than for males, although care should be taken in interpreting the results, since the generational difference in tertiary education participation is much greater for females. Japan is an extreme example amongst advanced economies in terms of its level of population ageing, as well as the relative size of its immigrant population. It therefore presents an interesting case for other advanced economies. Our results suggest that positive information campaigns may be effective in affecting public attitudes towards immigration positively, especially amongst female voters. 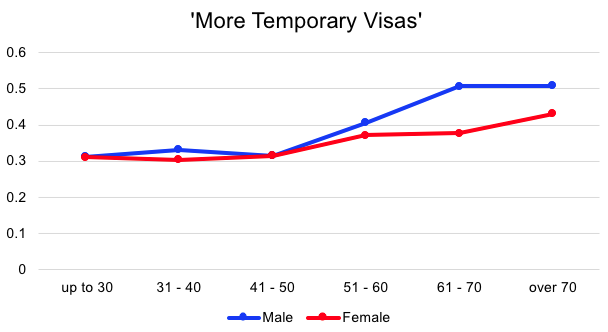 Moreover, the perception of male respondents about immigrants as potential competitors may be causing the deep generational gap in the attitude towards immigration. The absence of difference in the impacts of information across age groups or educational backgrounds may reflect a relative success of the compulsory primary and secondary education in Japan over a long period of time in restricting the gap in basic skills, including literacy and numeracy. This aspect merits further investigation to evaluate the effectiveness of information campaigns in other countries. Citrin, J, D P Green, C Muste, and C Wong (1997), “Public opinion towards immigration reform: The role of economic motivations”, Journal of Politics, 59, 858-881. Dancygier, R M, and M J Donnelly (2013), “Sectoral economies, economic contexts, and attitudes toward immigration”, Journal of Politics, 75, 17-35. Dustmann, C, and P Preston (2006), “Is immigration good or bad for the economy? Analysis of attitudes toward immigration”, Research in Labor Economics, 24, 3-34. Facchini, G, Y Margalit, and H Nakata (2016), “Countering public opposition to immigration: The impact of information campaigns”, CEPR Discussion Paper no. 11709. Nakata, H (2017), “Attitudes towards Immigration in an Ageing Society: Evidence from Japan”, RIETI Discussion Paper 17-E-095. OECD (2015), International Migration Outlook, Paris: OECD. Sides, J, and J Citrin (2007), “European opinion about immigration: The role of identities, interests and information”, British Journal of Political Science, 37, 477-504.